Location: East side of Sandholme Road just south of its junction with Landing Lane. 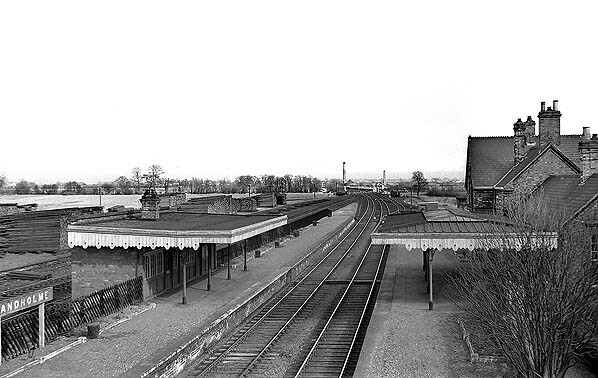 Notes: Sandholme station had two facing platforms with the main station building on the up side. It was typical of other stations on the line being built in the domestic revival style – with decorative external brick courses between floors and brick lintels. 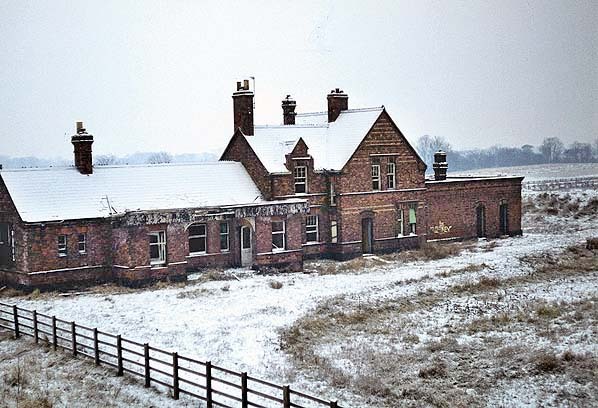 The building incorporated a two-storey stationmaster's house with single-storey wings at either end containing, station offices, waiting rooms and toilets. There was a very wide canopy with a fretted valance in front of the booking office and waiting rooms. The booking office was at the east end of the building with a decorated valance above the entrance. A brick waiting room with a canopy was provided on the up platform. The goods yard was on the up side and comprised two sidings, one running behind the up platform serving a cattle dock and pens and the other curving round the southern perimeter of the yard which served the coal depot. There was also a single siding on the down side running behind the platform. The signal box was some distance to the east of the station on the up side, just before the rail connected Sandholme Brick and Tile Works. The 1890 map reproduced below shows a yard crane but this is not shown on later maps and is not listed in the Railway Clearing House Handbook of Stations in 1904. The yard handled a full range of goods traffic including livestock. By the turn of the 20th century an 11 road marshaling yard with a shunting cabin had been provided on the down side; this is where trains were formed up before climbing over the Wolds to Hull. There was a second 7 road marshalling yard with a turntable on the up side to the east of the station just West of Thornron Dam Lane. From this yard a private siding served the Sandholme Brick and Tile Works. After closure to passengers in 1955 the station remained open for good traffic until 6 April 1959. 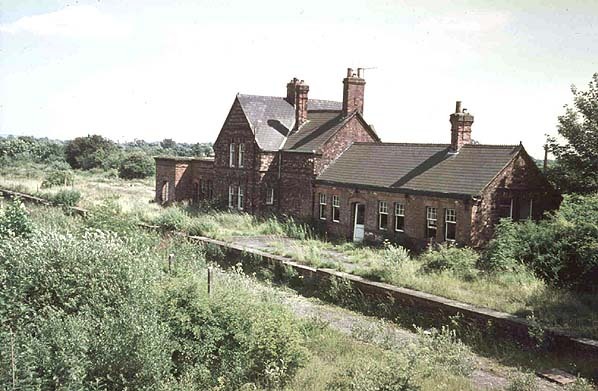 The down platform waiting room was quickly demolished and by the late 1970s the trackbed has been infilled almost up to platform level although the station building was to remain empty and unused for many years. Some time in the 1990s or early 2000s renovation started; this included the demolition of the book office. It would appear that the work was never completed and in the late 2000s the partly renovated building was empty and getting vandalised. 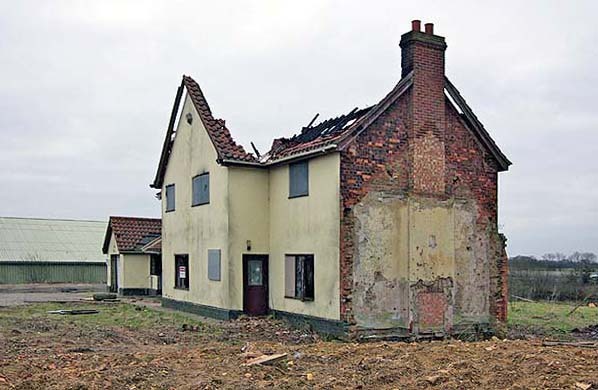 It was gutted by fire in November 2010 and arson is suspected. 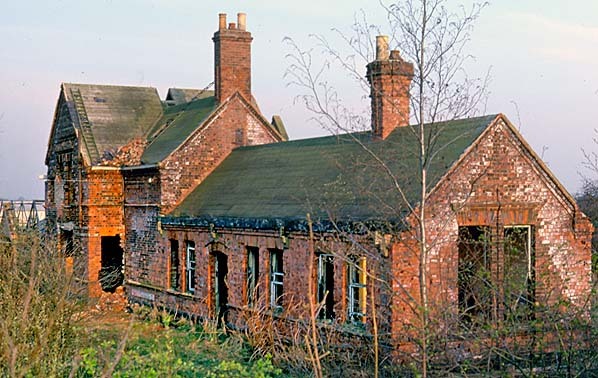 The building was demolished in early 2012 and evidence of drug use was found in the building at this time. .
A westbound passenger train stands in the up platform at Sandholme station in the first decade of the 20th century. 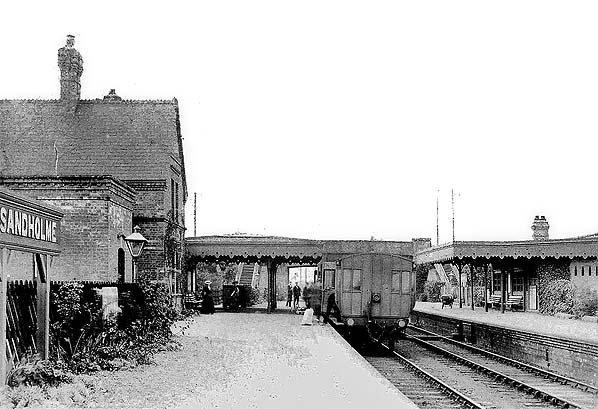 The majority of Hull & Barnsley stations had substantial buildings far larger than the small number of passengers that ever used the line warranted. 1890 1:2,500 OS map shows the layout of the station and goods yard before the marshalling yard was added. The goods yard is to the south of the station where there are two sidings. One runs behind the up platform, the other which served the coal depot, curves round the southern boundary of the yard. Another siding runs behind the down platform. A crane is shown at the east end of the up platform. 1909 1:2,500 OS map shows the station layout after the marshalling yard had been built. The crane appears to have been removed and not is listed for the station in the 1904 Railway Clearing House Handbook of Stations. 1922 NER plan of Sangholme station and sidings. Click here for a larger version. 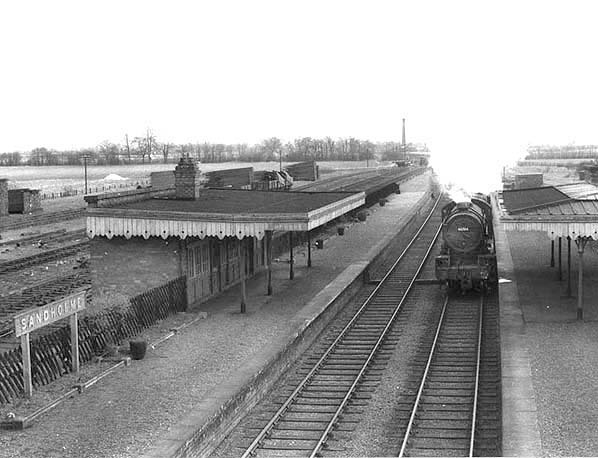 Sandholme Station looking east from Sandholme Road bridge later in 1959. The up side canopy has been removed and the waiting room on the down side partially demolished. 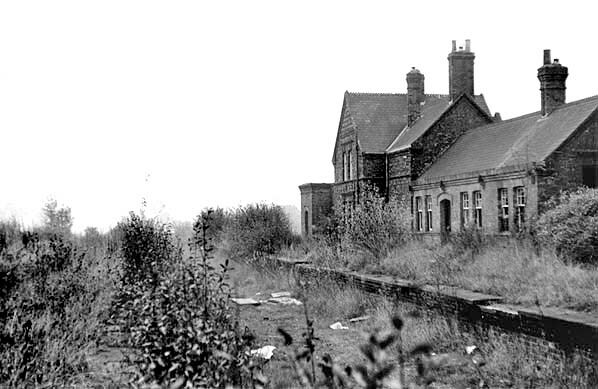 Sandholme station building seen from Sandholme Road in 1969. 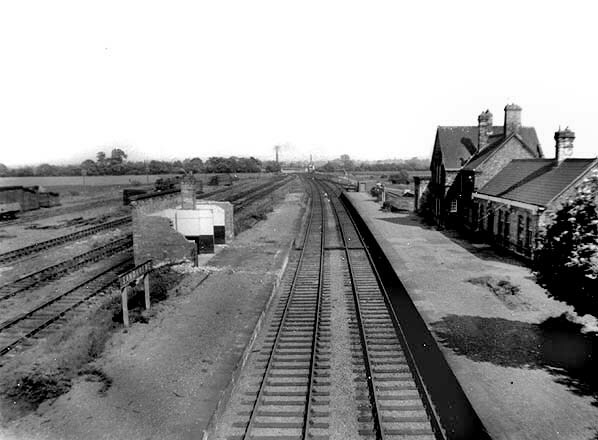 Sandholme station looking east in from the up platform October 1971. 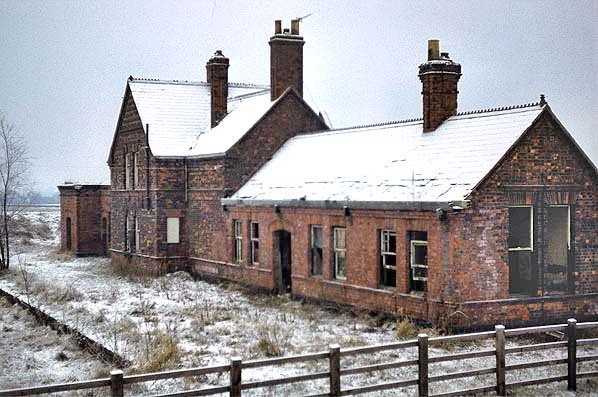 Sandholme Station in January 1979. Sandholme station building in April 1987. Sandholme station in March 2006. The platforms and tracks were at this side. It would appear that an extension to the west end is imminent as footings have been excavated following demolition of the original west end of the building which included the booking office in December 2005. Sandholme Station looking east in March 2011. 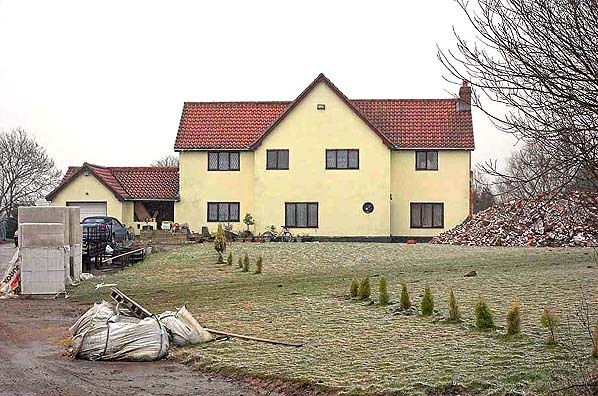 It would appear that the house conversion was never finished as the building had been empty and vandalised before being gutted by fire in November 2010; arson was suspected. The building was demolished in early 2102 and some evidence of drug use in the building was found at this time. Looking south at the site of Sandholme station in July 2014 taken from a similar viewpoint to the 2011 picture above. The station building stood beyond the breeze block wall. 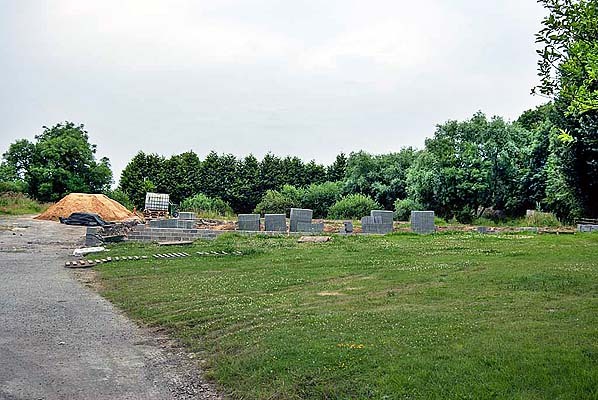 A new bungalow is under construction on the alignment of the railway trackbed.